Each year since having children we always do a holiday card with a photo. I love sending personalized photos of the kids to all of our family and friends. This year I was offered to check out Paper Culture and review their holiday cards. I took some photos of the girls in their holiday dresses and uploaded them to Paper Culture. 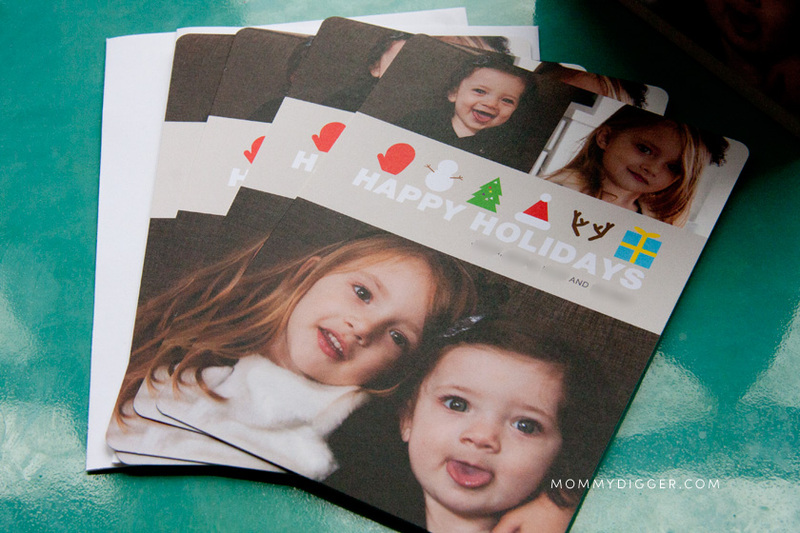 I was able to look at each of the holiday card designs that I liked and preview our photos on them. Paper Culture has so many different design options available that you can customize with pictures and you can choose to use one for or 5 photos. I chose to do 3 photos, one of both of the girls and an individual picture of each of them. Once your done customizing your card you can choose to print it with a free designer review or even get free assistance from their team of designers. That way you know your holiday cards are going to turn out exactly how you want them. I’ve had nightmares in the past using other companies. My cards had turned out completely different than I expected in the past and was glad that with Paper Culture I could eliminate the possibility for things to go awry. See more about what makes Paper Culture different than other companies you may have used to print. Here are our beautiful holiday cards for this year from Paper Culture! I think they turned out great, and the quality of the paper is high quality. Plus it’s 100% recycled paper! Aren’t they so nice?! (by the way, I blurred out our names, that’s not the way it looks in real life) The design I chose is called Christmas Icons. Paper Culture also has a great service to help take some of the stress of the holidays off of you. They offer free mail and address service. If you provide them with your holiday card recipient list they will stamp, mail and address your cards for free. You just cover the cost of the stamp! I love our Paper Culture holiday cards and will definitely be a returning customer next year. I love all the additional added convenience and quality features they offer at no cost. There are tons of great designs to choose from too! Paper Culture also offers cards for all occasions and even photo wall decals in addition to their holiday cards and invites. Visit Paper Culture and check it out. They are having a 35% sitewide sale through November 26, 2013, just visit www.paperculture.com to get started. For all the latest news & promotions from Paper Culture connect with them on Facebook, Twitter and Pinterest. WIN IT! One Mommy Digger reader will win $150 to use towards anything they’d like on the Paper Culture site! To enter fill out the form below. I received a gift card for holiday cards to facilitate my review. All thoughts and opinions are my own. I like the New Years CHEER card. I like the ‘just photos’ wall decals and the ‘mini frames’ decals! I’d choose the Whimsical Snowman holiday cards. I’d enjoy sending them out to loved ones and friends. Thanks. I like the We Wish You a Merry Christmas card. It is simple yet still very pretty. I love the simple ribbon design for a single photo but also love the holiday block card for multiple photos. So difficult to choose! I like the Joy Peace Love card or the Snowflake Cheers, though the classic snowflake would go better with our family pictures at the pumpkin patch this year. Would love to try out their website!